Being Frugal and Making It Work: HOT! 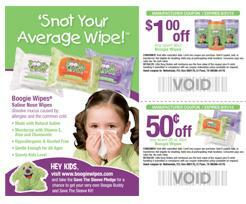 Boogie Wipes Coupon in This Sunday's Paper! If you love Boogie Wipes as much as we do, be sure to check out the paper this Sunday March 3. Select newspapers will feature an insert offering a $.50 and $1.00 off coupon! Be sure to look in your local paper for a Boogie Wipes money saving coupon this weekend, and while you're here... enter to WIN my Boogie Wipes Prize Pack giveaway!